The men who made up the ranks of 142 Commando in 1942/43 tended to be those who had chosen Army life as a career. They had certainly showed their mettle in one form or another in order to be selected for the specialist section of Commandos which would take it's place in each Chindit Column on Operation Longcloth. These men were tough and uncompromising types who lived up to the old adage of 'work hard, then play hard'. If the ordinary soldier that found himself part of the Chindit training in 1942 thought he had it tough, then he would do well to cast a glance over the fence and into the Ramna Camp in Patharia, where the 142 Commando personnel were put though their paces. Percy Finch was one such soldier, he had originally been part of the Suffolk Regiment and been garrisoned earlier in the war on the North West Frontier of India, now he found himself part of Chindit Column No.1 during training and under the overall command of Major George Dunlop MC. After several weeks of hard and exhaustive drills and manoeuvres the men of 142 Commando were looking forward to the Christmas holidays and a welcome break from training. But sadly, on Christmas Eve everything went horribly wrong for the Lance Corporal and his closest Chindit comrades. Transcribed below is a three page document recording the Court of Enquiry set up to investigate the sad, and unfortunate circumstances of Lance Corporal Percy Finch's untimely death on 24th December 1942. This information was taken from the 142 Commando War Diary for January 1943. Court of Inquiry into the death of 5826325 Lance Corporal P. Finch, 142 Company, 77th Indian Infantry Brigade. Assembled at Jhansi 26th December 1942. By order of Lt. Colonel L.A. Alexander, C/O No. 1 Group, 77th Indian Infantry Brigade. Elected Members-2/Lieut. G. L. Harvey and 2/Lieut. B. P. Wormall. The court having assembled pursuant to order, then proceeded to take evidence. About 21:00 hours on the night of December 24th 1942 I went down to Lance Cpl. Finch's tent in the section lines. On arrival there I found Lance Cpl. Finch and Pte. McMurran. We each had a small tot of rum, and followed it with a mug of beer. I should say at this stage that Lance Cpl. Finch was what would be termed as 'merry' but in full control of his senses. I suggested that we should go out for some supper, but Finch said "Well have a small bang first, and then go." He then left the tent and returned within a few minutes with three sticks of explosives (type 808), about 5 inches of safety fuse, and a detonator. He tied the sticks of 808 together and carefully inserted the detonator, with the fuse attached into one of the sticks. The fuse had already been cut as for igniting. There was a candle in the corner of the tent about 3 feet from the entrance flap, which was folded back. Finch declared that he would light the fuse with the candle. I suggested that he should light the fuse outside, in the correct way, with matches. He said that it would quite alright if he lit the fuse with the candle, as he could easily step outside and throw the charge to a safe distance. He then put the end of the fuse in the candle flame, but did not succeed in lighting the powder. The tip of the tarry matter of the outer casing began to smoulder. Finch stepped outside, and I thought he had thrown the charge. A few seconds later I heard the fuse burning. I did not hear any matches struck, I could not see Finch at this time, Pte. McMurran and myself having remained seated in the tent. About 10 seconds later I heard the charge explode. This would be sometime shortly after 21:15 hours. The next thing I heard was Finch groaning. I rushed out of the tent to see what had happened and found Lance Cpl. Finch about 10 yards away, up against the next tent. He was lying on his back and obviously badly injured. I told Pte. McMurran to get field-dressings and blankets, I went for the Company Medical Officer. On the way back I met Pte. Maley and told him to get more field dressings and blankets for Finch. The Medical Officer was not to be found so I went to the Sergeant's mess and told the Company Sgt. Major what had happened. He sent me to get a truck from the M.T. (motor transport) lines and he himself went down to the section lines with Sgt. Carey. I went to the M.T. lines and brought a truck over to the scene of the accident. This took me a quarter of an hour at the outside by which time a Medical Officer was attending Lance Cpl. Finch. The Medical Officer administered morphia to the injured man, and we then took him to the British Military Hospital in the truck. Question 1. Could Lance Cpl. Finch have tripped up and fallen before the explosion took place? Answer. I did not hear him fall, but the lane between the tents in which he was later found, was obstructed by the end guy-ropes of two tents, which were fastened to the same peg. Question 2. Could you tell from the position in which you found him, if Lance Cpl. Finch might have tripped over these ropes? Answer. Yes, it looks as though that had happened, because he was lying with his head close to the tents and his feet towards the ropes in question. The flash insignia of 142 Commando in 1943. Second Witness. Pte. 878620 W.G. McMurran, 142 Company. I was sitting in my tent with Lance Cpl. Finch having a drink of beer. Sometime later, I cannot give the exact time, Lance Cpl. Brock came in. We had some rum, then Lance Cpl. Finch went out. Shortly afterwards he lit an M.L. flare, and then returned to the tent. We each had another beer and then Lance Cpl. Finch went away for about 20 minutes. On his return we drank more beer and then Finch announced that, "we would have a bang." By this he meant an explosion. He again went out and returned with three sticks of 808 explosive and 6 inches of safety fuse and a detonator. He tied the sticks of 808 together, assembled the fuse and detonator, and put the latter into the explosive. He then put the end of the safety fuse into a candle flame after which he stepped outside. Very soon afterwards I heard the charge explode, and then moaning. Lance Cpl. Brock and I rushed outside and found Lance Cpl. Finch huddled up by the corner of the next tent. I fetched blankets and field dressings, which were applied by Pte. Maley who had come to the scene of the accident. Lance Corporal Brock had gone to get a doctor. Question No.1. Was Lance Cpl. Finch under the influence of drink? Answer. Yes, but he knew he was doing. Question No. 2. Do you think that anything might have happened to prevent Lance Cpl. Finch from throwing the charge. Answer. Yes, judging from his position when we found him he might have tripped over a guy-rope. Question No. 3. Did you hear or see anything of Lance Cpl. Finch after he left the tent? Answer. No, not till after the explosion. Question No. 4. Did you notice if the fuse was burning correctly as Lance Cpl. Finch left the tent? Answer. Although the fuse was smouldering, the normal hissing sound which accompanies proper ignition of a safety fuse could not be heard. Third witness. No. 3521566 Pte. R. Maley, 142 Company. At 21:25 hours on the night of 24th December 1942 I was at the canteen when I heard an explosion and saw a flash. I did not take much notice as there have been numerous explosions in the town and camp that evening. Shortly afterwards I left the canteen to go to the section lines. On the way I met Lance Cpl. Brock who told me that Lance Cpl. Finch had been seriously injured in an explosives accident. Brock told me to run down to the lines and see what I can do for him. At the lines I found Lance Cpl. Finch lying beside a tent and Pte. McMurran standing over him seemingly too dazed to know what to do. He had procured field dressings but had not yet used them. Finch was injured about the face and body and his right hand was severed. I did what I could for him, and wrapped him in a blanket. One Medical Officer then appeared on the scene and administered morphia. After this he was taken to hospital in a truck. The tent by which I found Lance Cpl. Finch had its end guy-rope fixed to the same peg as the rope from the tent on the opposite side. Lance Cpl. Finch seemed to have tripped over these ropes as he was about to throw the charge. Kirkee War Cemetery, near Pune in India. Where Percy Finch is buried. Fourth witness. Lieutenant J.L. Watson, 142 Company. I commanded No.1 Section of 142 Company to which Lance Cpl. Finch belonged. At the time of the accident he was not on duty. Orders were published on 20th December 1942 to the effect that no explosive stores would be used without authority as Brigade exercises were now complete. (A true copy of the order was detailed and submitted to the court). Question No. 1. Where were the explosives stored at the time of the accident? Answer. In the senior NCO's tent in the section lines. Question No. 2. What type of stores were there? Answer. Mobilisation stores packed in boxes and training stores loose in two boxes. Question No. 3. Was there a sentry posted outside of these tents? Answer. No there was not. Question No. 4. How long would it take for five inches of safety fuse to burn? Answer. Approximately 15 seconds. This time depends on the condition of the fuse, but, it is unlikely to have burnt in under 10 seconds. Question No. 5. Would the smouldering of the fuse casing cause the powder in it to ignite? Answer. I cannot give a definitive answer to the first part of your question as a normal flame will not ignite the powder trail, but the smoulder of the casing would ignite the detonator if it reached it. Fifth witness. Sgt J. Carey, 142 Company. Personal effects including pay book, piece of postcard, handkerchief and some money. The first three articles were violently shredded. A detonating set for one and one quarter pound incendiary. Nine rounds of blank ammunition .303, showing signs of having been in a fire. Nine inches of expended instantaneous fuse. Four and a half inches of burnt safety fuse with part of a detonator attached. Five and a half sticks of gelignite with five sticks of 808 explosive. Two pieces of adhesive tape. Sixth witness. Captain N. F. Stocks RAMC. On 24th December 1942 at about 22:00 hours, I was at Brigade Headquarters when several soldiers came in and asked me to attend a casualty in the column lines. They said that he'd had an accident with some gelignite. I found the casualty, Lance Cpl. Finch lying outside a tent with a blanket over him. On a brief examination I found multiple injuries the worst being the right hand severed, and a large gaping wound in the chest and abdomen. I put on more blankets and went for a stretcher and morphia of which I injected half a grain. He was in severe shock, but conscious. I went with him in a truck to the British Military Hospital at Jhansi, where he was taken to the operating theatre. The O/C of the Hospital and the Duty Officer treated him, but he died 20 minutes after admission. Further examination had revealed the extent of the injuries. 1. Gross ragged wound in the mid-line, penetrating chest and abdominal cavities, Viscua (organs) were protruding. 2. Traumatic amputation of the right wrist and hand and massive loss of tissue to the right fore-arm. 3. Numerous small lacerations of the head and face. In my opinion, cause of death was surgical shock due to the above-mentioned injuries. Question1. Do these injuries suggest that he may have been lying on the charge at the time of explosion? Opinion of Officer Commanding No.1 Group. In my opinion No.5826325 Lance Cpl. P. Finch of 142 Company, was to blame for the accident which resulted in his own death. Being intoxicated, he did not realise the danger which might result in playing about with explosives and also by using explosives contrary to the orders issued on 20th December 1942. I also consider that Lance Cpl J. Brock and Pte. McMurran of 142 Company, were also in a state of not caring what was happening, otherwise they would have prevented Finch from playing about with the explosives in the first place. Signed by G. Dunlop. (Officer commanding, Column 1, 77th Indian Infantry Brigade). Opinion of the Brigade Commander. I agree with the opinion of Officer Commanding No.1 Group. As a discipline, all Other Ranks and NCO's will now not access any demolition stores without absolute authority. Signed by L.A. Alexander. (Officer commanding, Southern Section, 77th Indian Infantry Brigade). Certified by this court as a true extract. Jhansi 26th December 1942. Composition of 142 Commando personnel for Column 1, as of January 1943. 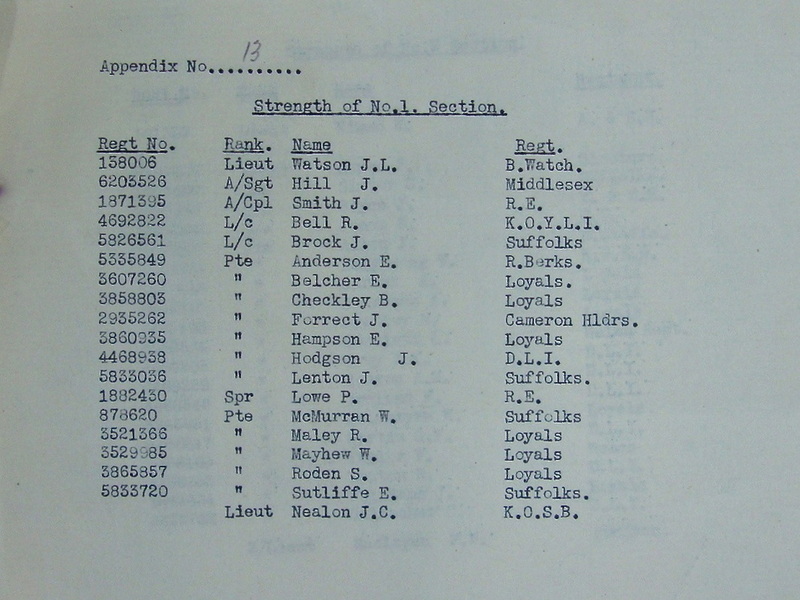 The above mentioned men are the 142 Commandos of Column 1, as listed just before they entered Burma in February 1943. These men were Lance Corporal Percy Finch's colleagues and comrades and many are mentioned or gave witness to the Court of Enquiry investigating his death. Lieutenant J. L. Watson was thrown from his horse on 9th February 1943 as the Column were preparing to cross the Chindwin River. He was taken back to hospital in India and played no further part in the operation. Jack Hill was captured after suffering a wound from mortar fire, he died in Rangoon Jail from the ravages of Beri Beri. Thomas Smith was killed in Burma, circumstances unknown. Lance Corporal Bell returned safely to India in May 1943. John William Brock died a prisoner of war in Rangoon Jail suffering from Beri Beri. Pte. E. Anderson returned safely to India. Ernest Belcher died as a POW, possibly in the Maymyo Camp. Pte. B. Checkley was liberated from Rangoon Jail in May 1945. Pte. J. Forrect returned safely to India. Captain N. F. Stocks RAMC survived Operation Longcloth and returned to India. Edward Hampson perished in Block 6 of Rangoon Jail. James Hodgson died whilst in Burma, circumstances still unknown. Jack Lenton died whilst in Burma, circumstances still not known. Sapper Percy Lowe died as a prisoner of war, possibly in the Maymyo POW Camp. He had been experimented upon by Japanese doctors testing new malaria drugs. Pte. W. G. McMurrin was liberated from Rangoon Jail in 1945. Robert Maley perished a POW, possibly in the Maymyo POW Camp. William Mayhew died whilst in Burma, circumstances unknown. Stanley Roden was killed in action in Burma. Ernest Sutcliff died in Burma, circumstances unknown. Lieutenant John Nealon had only recently been promoted through the ranks from Sergeant in late 1942, but when Watson was sent back to hospital after his accident, Nealon found himself in charge of 142 Commando, Column 1. He performed heroically throughout the expedition, but was unlucky enough to be taken prisoner as the Column attempted to return to India. Lieutenant Nealon was liberated from Rangoon Jail in 1945. 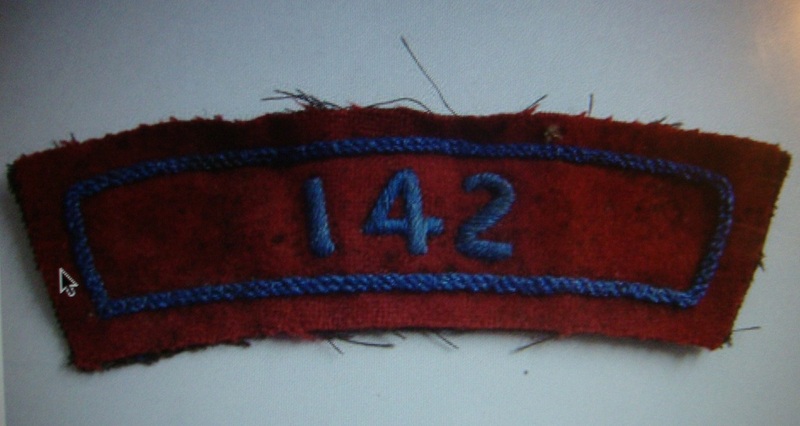 As you can plainly see 142 Commando, Column 1 did not have the best of luck when it came to surviving Longcloth in 1943. This has much to do with their placement in Southern Section in 1943, which of course was used as a diversion or feint for the main operational objectives performed by their partners in Northern Section. Nevertheless a survival rate of just 25% is quite damning. 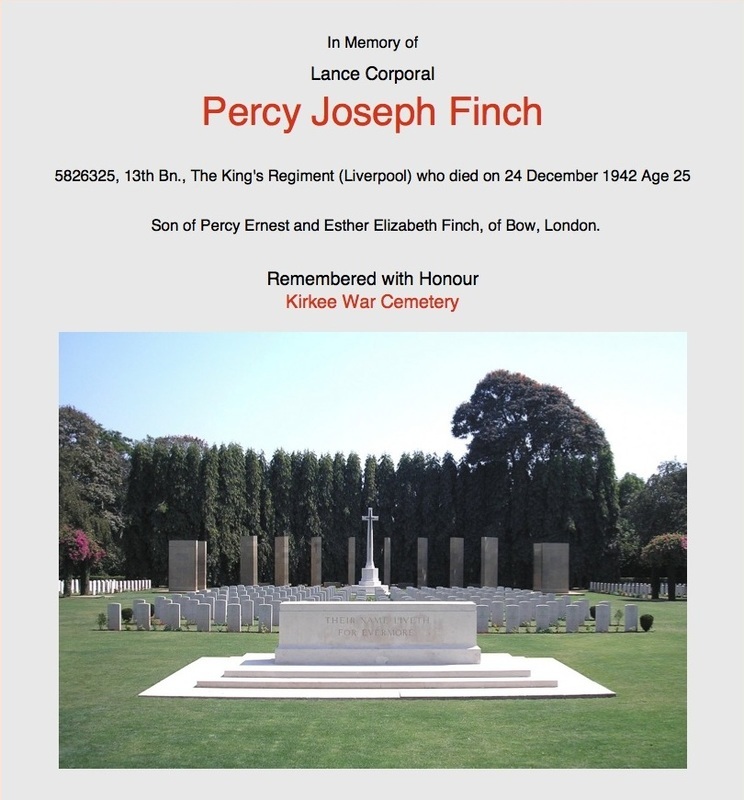 Below is an image of Percy Finch's grave stone located at Kirkee War Cemetery. Kirkee War Cemetery was created in 1952 to receive Second World War graves from the western and central parts of India where their permanent maintenance could not be assured. 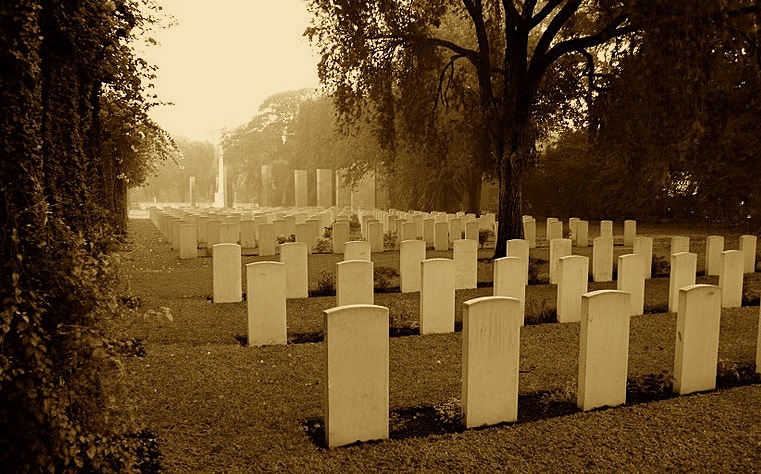 Kirkee, also known as Khadki, is a Military Cantonment adjoining the large University town of Poona on the plateau above Bombay, the cemetery contains 1,668 Commonwealth burials of the Second World War. Thanks to The War Graves Photographic Project for providing this wonderful photograph from so far away. 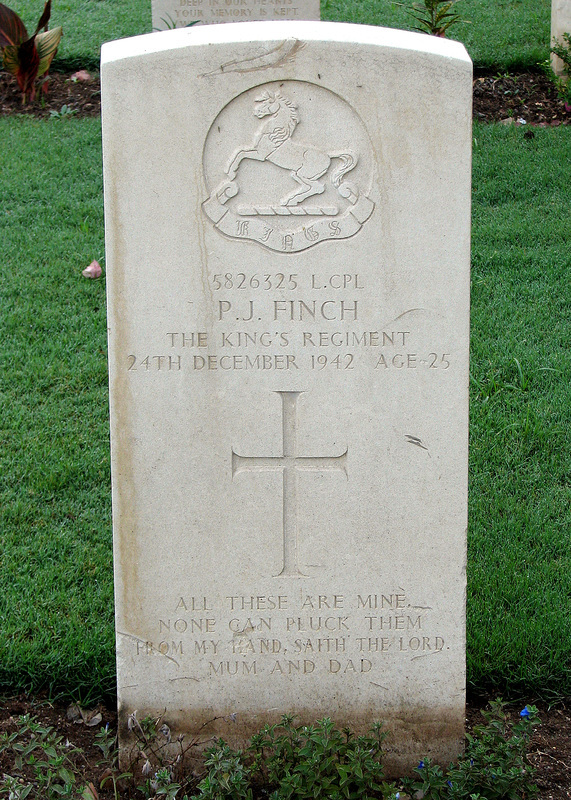 Grave Stone of Percy J. Finch, located in Kirkee War Cemetery, India.